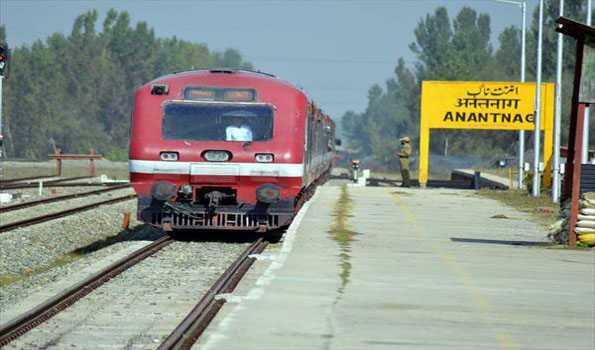 Srinagar, Jan 14 :Train services on Monday resumed after remaining suspended on Sunday for security reasons in south Kashmir, where a top Al-Badr commander was among two militants killed in an encounter with security forces on Saturday evening. However, train services between Srinagar-Badgam and Baramulla in north Kashmir was not affected and trains were running as per schedule. Train service resumed in south Kashmir on Monday morning, a railway official told TNN. He said, therefore, all trains will chug between Badgam-Srinagar-Anantnag-Qazigund in south Kashmir to Banihal in Jammu region. This was the third time that train service was suspended in south Kashmir in 2019. The service was suspended in south Kashmir on January 4 for security reasons in view of the killing of three militants in Pulwama. The train run was again suspended in south Kashmir on January 5 following heavy snowfall. Suspension of train service badly affect thousands of passengers travelling between Baramulla-Srinagar-Banihal daily since it is cheap, fast and safe against other mode of transport available in the valley. “We are acting on the advice of local administration and police,” he said, adding safety and security of passengers besides railway staff and property is important. "We expect heavy rush of passengers in the morning on Monday when they had to resume their normal activities after Sunday, " he added.